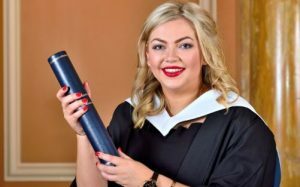 In our latest blog, our QNIS Undergraduate Prize Winner from QMU, Jade McNee, tells us about her experience of community nursing. My first ever placement as as a student nurse was withing a District Nursing team. I was extremely nervous and apprehensive and did not know what to expect. I vividly remember the first home visit I went on with my mentor to a man who had advanced MS and was bedbound. He had a grade 4 pressure ulcer on his sacrum which was being ‘packed’ daily. I will never forget leaving his home and wondering if I was cut out for dealing with such sad situations. However as the placement progressed, so did my resilience and strength! I began to realise that it was an honour being able to help people within their homes. I loved every minute of the 5 week placement. From then on I knew that I wanted to pursue a career within the community. Four years later, I returned to the community for my management placement. This experience was so different because I had more nursing experience behind me and I was given more freedom by being allowed to take on my own case load and visit my own set of patients. It re-affirmed my passion for community nursing, I loved being able to nurse people within their home environments where they feel most comfortable. Enabling individuals to remain at home felt so rewarding. Wound care is also an area of interest for me and I was able to gain a lot of experience within this area during this placement. When I discovered I had won the QNIS Undergraduate award I felt so proud of myself. It meant so much to me to have won something that confirms my passion for community nursing. The journey I had been on since that first day as a student nurse felt so worth it to have gained recognition at the end of it all!